John Ovenstone clears the danger for Tayport. Pic by Ron Nicoll. Tayport slipped to a second successive McBookie.com Super League defeat at Sauchie, a result which leaves the Canniepairt outfit propping up the table. The hosts made the breakthrough after only eight minutes. After neat play down the left, forward Kelly unleashed a shot from around 20 yards which ‘keeper Richard Cargill was unable to prevent from going into the bottom corner of the net. Tayport pushed for a leveller and had two efforts deflected over the bar. Matt Adam had a chance midway through the half when he found himself space in the middle of the box, only for a covering defender to intervene. Scott Finlay then played a corner into the path of Stefan Elvin and the midfielder’s strike suffered the same fate. Towards half-time Sauchie went back on the offensive and Kelly should have netted his side’s second. Richard Cargill pushed a shot into Kelly’s path but the striker knocked the ball over the top before firing another strike over. 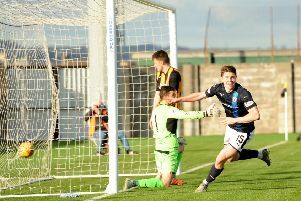 Skipper Stefan Elvin tried to galvanise his troops and went close early in the second half but home ‘keeper Harkness just managed to gather the ball and stop it from crossing the line. Unfortunately the game’s crucial second goal went against Tayport. The Beechwood Parkers scored again on 75 minutes, effectively sealing the points. Front-man Kelly held the ball up for Millar, who advanced into the box and slotted a left-footed shot past Cargill. Alan Tulleth reduced the deficit with a 25 yard free kick, but there was no way back. As time ebbed away, Tulleth was dismissed for collecting his second yellow card. Tayport - Cargill, Anderson, Rennie, Kay(Docherty), Ovenstone, Elvin, Rollo, Tulleth, Adam, Connelly (Sutherland), Finlay.